In the 1970's, the Washington Public Power Supply System (WPPSS, aka "whoops") began the largest nuclear power plant construction project in U.S. history: reactors 1, 2, and 4 at Hanford, and reactors 3 and 5 at Satsop, west of Olympia. As the budget swelled to $25 billion, and public opinion turned against nuclear power (particularly after Three-Mile Island), the project was cancelled. This resulted in WPPSS defaulting on $2.25 billion worth of municipal bonds sold to finance the project, one of the largest municipal bond defaults in U.S. history. Ultimately only one plant was completed: Washington Nuclear Power Unit 2 (now known as the Columbia Generating Station), located on the Hanford Reservation. 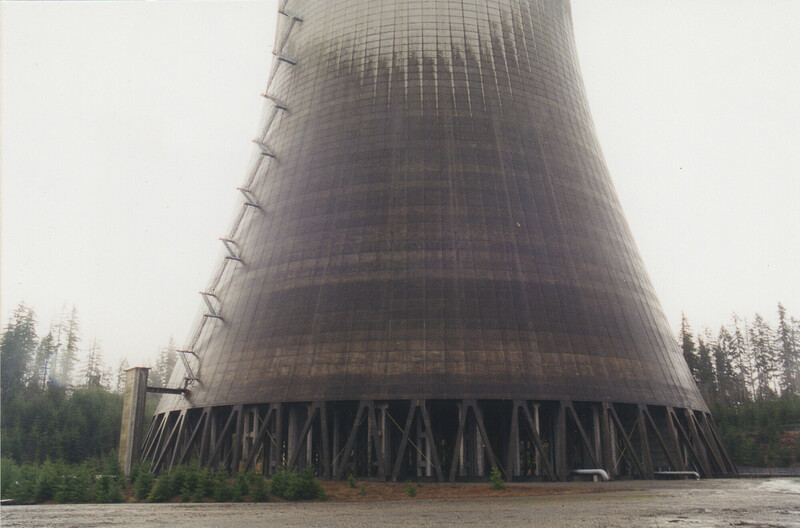 At Satsop, construction was well along, and plant number 3 was about 76% complete, with the reactor installed. Cooling towers, 480 feet tall - which had never produced a breath of steam - were left in place, while all hardware related to power generation was removed. The site has since been transformed into a unique business/technology park. The Washington Public Power Supply System is now known as Energy Northwest.